Twice recently we pulled a frozen Elmwood Stock Farm (certified organic, sustainably grown, pastured) chicken from our freezer, thawed it, brought it to room temperature, and roasted it just as Barbara Kafka instructs in the first recipe in her wonderful book, Roasting, A Simple Art. My summary: Heat the oven to 500 degrees F., put a few tasty things in the cavity (or not), put the chicken in a cast iron skillet and then into the oven legs first so the legs meet the hotter heat of the back of the oven. Don't do anything else for 50 - 60 minutes. No basting, no nothing - not even an instruction to salt the bird outside. Good add-ins for the chicken's interior: a cut lemon, salt, pepper, butter, a sprig of thyme or rosemary, garlic cloves, shallots, onion pieces, or, again, nothing. Salting or adding flavors inside is good; salt or fats on the outside of the skin harm browning in this fast/hot roast system. I used lemon, salt, pepper, and garlic both times, and butter once. The butter-less chicken was just as good as the one with butter inside. Your oven will be a big mess - no denying that - and your kitchen (or the entire square block where you live) may be smoky. Barbara's advice: Use your fan (of course), or if you are fanless, as we are in our old kitchen, open a window. The skillet went straight onto a burner, chicken drippings and the brown bits and all. I added a cup or maybe more of leftover wine, scraped and stirred once or twice, and cooked the liquid down to a thick, syrupy, splattery couple of tablespoons. So you can understand the kitchen ballet without having to buy a ticket: While the sauce reduced, our resident chicken carver reduced the bird itself to its component parts and arranged them on a platter. I stirred the juice of a lemon into the wine/dripping syrup, salted to taste, mixed well, and drizzled drops of this intensely flavored sauce over the carved chicken pieces. The combination of sour, salty, fatty/meaty "umami" tastes got all my attention. 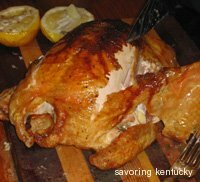 If you don't want to set off smoke alarms and would rather not clean your oven after a chicken dinner, here's a family recipe for Mother's "Basted" Chicken that cooks at a more temperate 375 degrees F., and is a different kind of delicious. One on of our roasting occasions, I made too much of the fabulous lemon dripping sauce. When I found it a few days later in the refrigerator, the chicken -- and even that signature smokey chicken smell -- had disappeared from the house. I dropped a tablespoon or two onto a couple of ounces of leftover poached tuna steak, mashed things up, expecting something like a super-dark, super-lemony mayonnaise. This nameless food was better. It made an unexpected -- and unexpectedly invigorating -- lunch. Barbara Kafka says that as much as she likes roast chicken itself, she may like the things that come along afterward even more. Stock, for her, is a given. I did not reliably make stock with chicken bones until I read Barbara Kafka and understood that broth or stock can come from nothing more than the remains of a great meal. No need for seven vegetables or aromatic herbs. No need, even, for skimming and clarifying, as long as the ultimate use is to add rich, clear flavor to additional simple food. Just bones, water, heat, and time. This is a fine thing to know, and I appreciate Barbara Kafka's sharing it, as I appreciate Mark Bittman's sauce that stretched the wonderful chicken's goodness into extra meals.